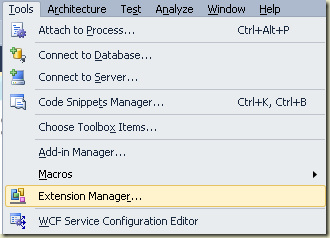 One of the features I think will be a big hit in Visual Studio 2010 is the Extension Manager. As of Beta 2, you can find the Extension Manager under the Tools menu. The Extension Manager allows you to download and install Visual Studio extensions from Microsoft and other 3rd parties. These extensions can include new controls and project templates for ASP.NET, Silverlight, and WPF, as well as new tools that work both inside and outside of Visual Studio. The first tool I saw when opening the Extension Manager was Gibraltar – a feature rich logging, monitoring, profiler tool recently demoed to me by eSymmetrix’s founder Jay Cincotta. 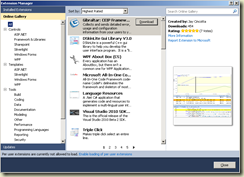 Visual Studio 2010 is the most extensible version of Visual Studio yet, and the Extension Manager will really highlight this fact. But, could it be even better? It’s painful to get setup with everyday development tools. It’s also frustrating to see how quickly developers on other platforms can get up and running. Package managers in general and RubyGems in particular make setup easy in an open source environment where fragmentation and spontaneity supposedly ruin a good integration story. … and so on. When I come back from lunch everything is downloaded, installed, and ready to go. Three weeks later I might get a notification that a new ASP.NET MVC Preview is available. I’d like to punch a button in Visual Studio to pull down the latest instead of poking around on CodePlex where downloads are hard to find. Tools like the Extension Manager and Web Platform Installer are getting us closer, but getting setup and staying up-to-date is still too big of a drain on productivity. Hey Scott, thanks for this post and the mention. 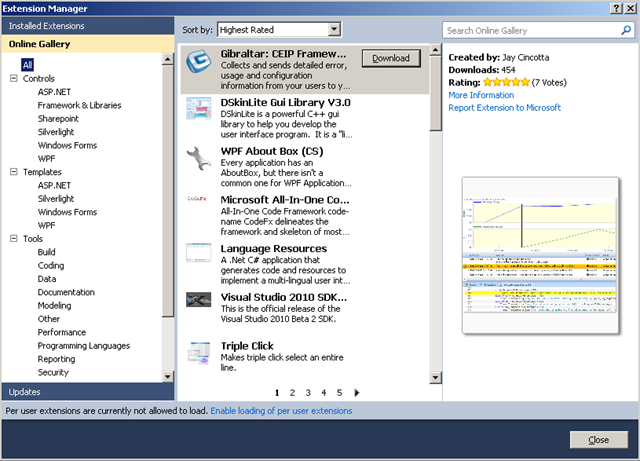 It's great that Extension Manager integrates with Visual Studio Gallery and it really brightened my Monday morning to see Gibraltar at the top of the listing. BTW, we're announcing a major enhancement to Gibraltar later this week. You can actually use the Extension Manager to look for updates to extensions that you've installed. If you bring up the Extension Manager, on the left hand panel, you'll find an Update button. If you click that button, the Extension Manager will look for updates to that extension on the VS Gallery.